Goodnight Raleigh continues to explore our city’s forgotten past. In this, our second installment of Project Bird’s Eye View, we reveal the history of the former Raleigh Sandwich Shop building at 215 S. Wilmington St. This Raleigh landmark is located just a few doors away from our first project entry, Slim’s Downtown Distillery. Judging by the rough common bond brickwork, the solid stone sills and lintels, and unadorned facade, 215 S. Wilmington likely dates from the antebellum period. This inset from CN Drie’s 1872 Bird’s Eye View map of Raleigh shows 215 S. Wilmington St. (highlighted). Metropolitan Hall with its clock tower can be seen in the foreground. 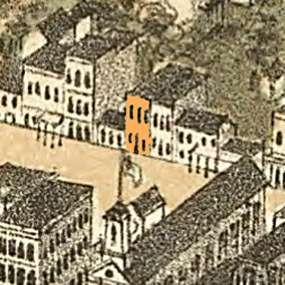 Following the erection of Raleigh’s first combination public hall and market house in 1840 in the 200 block of Fayetteville St., a cluster of brick and frame storefronts sprouted up along S. Wilmington St. over the ensuing 25 years. 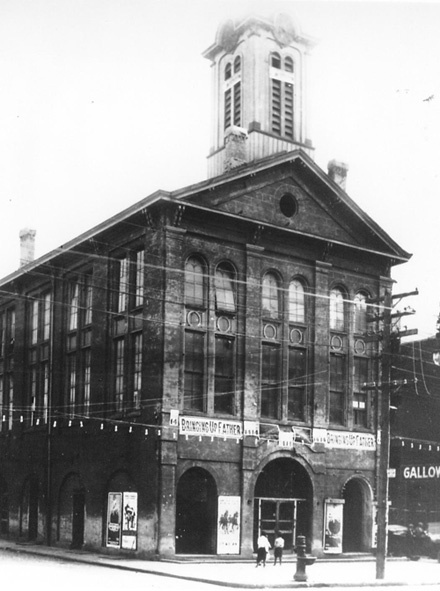 The 1840 building was destroyed by fire in 1868, and was soon replaced by a “modern” three-story brick Italianate-style structure on the same site. The new market building extended through the block from Fayetteville to Wilmington Street. It housed a double arcade of market stalls at street level, with a public hall and municipal offices above. It was topped off by a tower which contained the town bell and clock. By 1871 the grand building had become known as Metropolitan Hall. As with the 1840 structure, businesses associated with market activity around the new building flourished in the 200 block of S. Wilmington. These included wholesale and retail grocers, dry goods, cotton factors, auctioneers, restaurants (also known as “eating houses”), produce stands, billiard halls, and saloons. Both white and African-American merchants owned and operated these businesses side-by-side. The 1872 Raleigh city directory identified ten grocers, two bars, a bakery and a retail liquor dealer on S. Wilmington St. in the vicinity of the market building. The bustling 200 block of S. Wilmington St. about 1900. City Market can be seen on the extreme right. Early Raleigh city directories rarely gave a specific address for business listings. For example, the 1875 directory listed “JJ Johnson, grocer, Wilmington near Martin.” The first documentation for 215 S. Wilmington St. in a city directory appears in 1880: JJ Johnson & JW Barbour, grocers and provisions, liquor dealers and saloon; located east side Wilmington, 6 south Hargett. The 1872 Bird’s Eye View map (corroborated by the 1881 Shaffer and 1884 Sanborn maps) bears this out to be 215 S. Wilmington. In 1883, Raleigh adopted the “Philadelphia Plan,” which introduced a systematic numbering of street addresses. For the first time we see “Johnson & Barbour, liquor dealers and grocers, 215 S. Wilmington St.” The business occupied this address for the next 17 years. In 1901 a saloon run by WD Bright replaced Johnson & Barbour. An African-American businessman, John Jones, operated an “eating house” at 215 from 1905 until 1910. Then, two major events in early 20th century Raleigh history permanently altered the business composition of the 200 block of S. Wilmington St. — these were the introduction of state-wide prohibition in 1908 and the removal of the city market to Moore Square in 1914. Laying Belgian block pavement around Raleigh’s new city market in 1913. 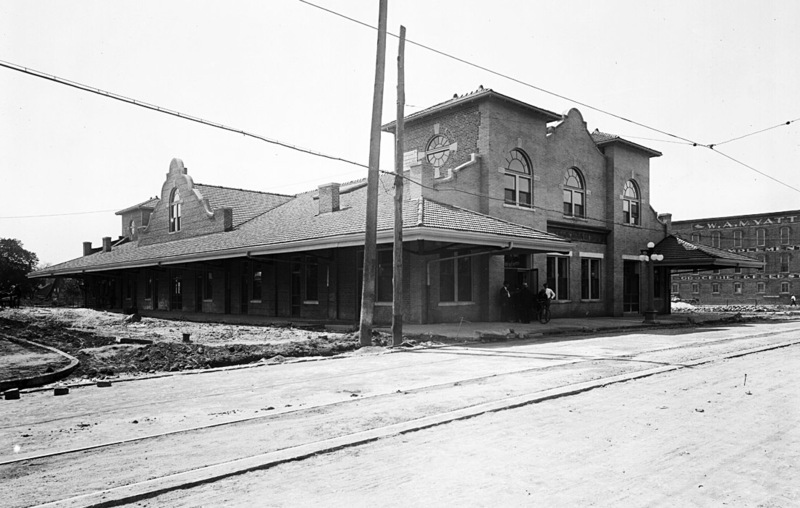 Although the saloons disappeared immediately, and the produce stands and other market-oriented businesses migrated over to the new facility, the 200 block of S. Wilmington retained much of its character of earlier years. Black restaurateur George Latham operated an “eating house” at 215 from 1911-1916, and an African-American physician, Dr. LE Capehart, occupied the second floor from 1909 until 1912. 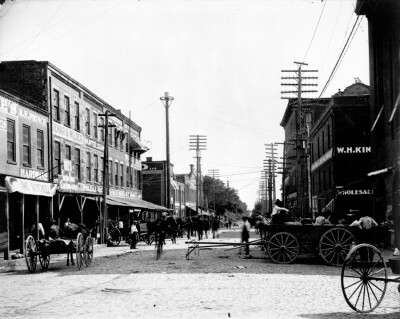 In the years following WW I, with the enforcement of stricter segregation laws, most Wilmington St. African-American merchants and professionals removed to E. Hargett St., which was then emerging as Raleigh’s “Black Main Street.” It was during this time that immigrant Greek newcomers to Raleigh began to set up shop on S. Wilmington. I’m not exactly sure what a ‘fruit store’ was in early 20th century Raleigh, but I imagine it was likely along the lines of what we would call a ‘convenience store’ today. Nonetheless, in 1936 John Capetanos’ Raleigh Fruit Store was listed in the city directory as a ‘restaurant.’ In 1937 he renamed it the Raleigh Sandwich Shop. The Raleigh Sandwich Shop as it appeared in the mid-1950s. John’s younger brother Christ Capetanos arrived in the U.S. in 1950 and soon went to work for his brother. When John died in 1960, Christ assumed ownership of the restaurant. He and his wife Mitsa ran the venerable Wilmington St. landmark until his retirement in 1989. The building has remained forlornly vacant ever since. 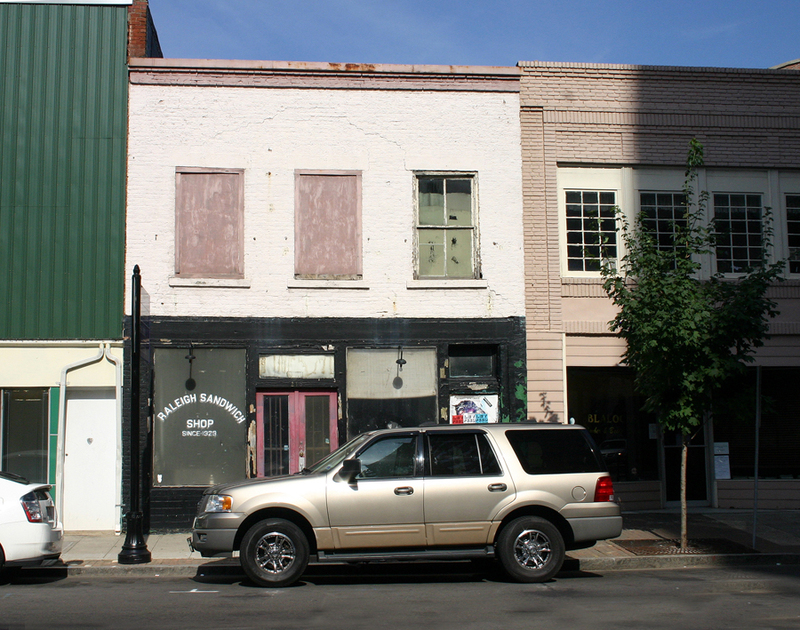 The Raleigh Sandwich Shop as it appeared in 2010. 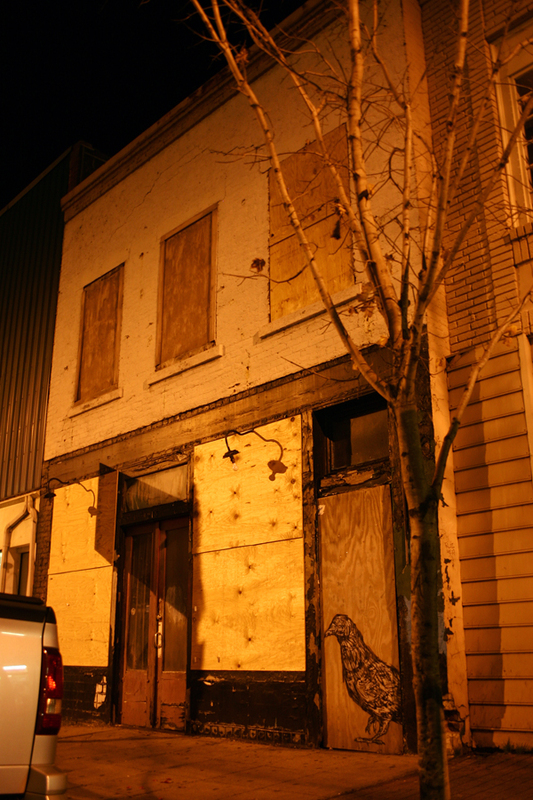 There was an attempt to rehab the building and open a bar there a few years ago, but nothing ever came of that endeavor. However, recent projects in the 200 block of S. Wilmington St. have brought us Slim’s club, Taz grocery, and The Busy Bee and Wilmore restaurants. Last month the iconic plate glass storefront windows of the Raleigh Sandwich Shop were boarded up. We can only hope that another project may soon be underway to resuscitate this storied downtown landmark. 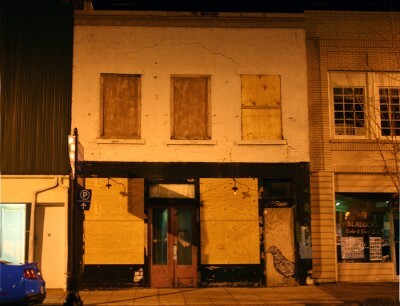 Sadly vacant and forlorn, the Raleigh Sandwich Shop patiently awaits revitalization. Timeline for 215 S. Wilmington St.
1870s — grocers, produce stands, restaurants, saloons flourish on Wilmington St. 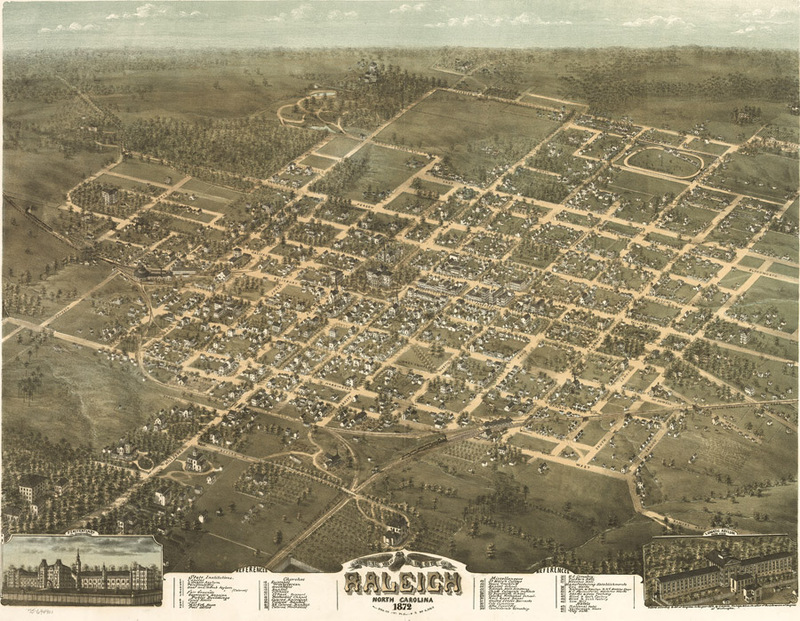 Although the intricately detailed drawing shows hundreds of structures across Raleigh, most have long been lost. Project Bird’s Eye View is a new series in which we will attempt to document the remaining structures from this historic map, and to provide a small bit of history of the building over the years. Unless otherwise credited, all photos in this article are by Raleigh Boy. Excellent. Good research and writing. Entertaining and informative. Keep ’em coming. Bravo! The Raleigh Sandwich Shop was a rowdy place in the 1980’s – selling far more malt liquor than sandwiches. I recall the owner wearing/keeping a gun behind the counter. I also recall that it was around that time when WRAL first started reporting the sanitation grades of restaurants. They reported the RSS receiving a C because while the inspector was present, he witnessed an employee dump a bucket of mop water over a strainer of lettuce. Yuck. I heard it may become a gluten-free restaurant. Fingers crossed! 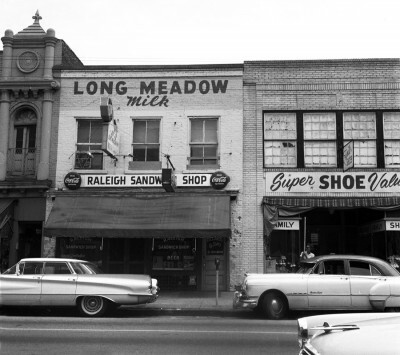 For some real fun stories about the Raleigh Sandwich Shop, stop in Turner’s Printing. Stuart – owner of Turner’s – worked at what was then his father’s printing company when he was kid. He can tell you a lot about this block of Wilmington Street. It’s fascinating! Looking at the 1950s photo makes me wonder what might be left behind that blue-green facade on the building immediately to the left. I appreciate your interest in this long-ignored institution, and as a follow up to the ’08 post. Though, I do think you’re inaccurate in a couple areas. It was sold in 2008 to Land Loch, LLC for $239,200. (Opinion here) Quite a longstanding eyesore and an under-utilized building. The previous owners should be ashamed for letting the building (and their family’s legacy) decay as it did for the better part of two decades until its sale in ’08. Hopefully, the current owner doesn’t just sit on it and wait for another “Fayetteville Street” type Wilm Street renaissance … it’s been exactly 3 years since the most recent purchase. The Raleigh Sandwich Shop was something in the late 90s. I think it was a bar, since I don’t remmber it being open for lunch, but the doors would be open at night. I was working late in 133 Fayetville St. the night it had a fire. Fire trucks were on the scene for a while, and it has been closed since. LOVE this article!! I press my face against the door glass of that storefront every time I walk by and joke with my husband that “someday I’m going to open this back up as a sandwich shop!” I was so interested to hear the background on this landmark and I so hope someone does something wonderful with it soon! As always, well done RB. So much information. So great. Like NCSU, I also wonder what’s left of the building to the left of the Sandwich Shop. Was the cornice chiseled away in the 1960s when that metal front was placed over the facade? Even though the tiny cupola is surely gone, perhaps there is more left underneath. It would be great if just like the former G&S Dept. Store across from it, that ugly corrugated metal front was removed. NCSU and John Morris — Yes, I too wonder what the removal of the corrugated metal mask at 211-213 S. Wilmington might reveal. It has been there as long as I can remember. I do have a photo, though, which shows the original building as it appeared in the mid-’50s. There were actually TWO cupolas located on either side of a central double-decked pediment — quite impressive! I will publish it in a future Bird’s Eye View post. If only the city would let the gluten -free restaurant open up. I hear it is something to do with the city building that parking deck too close to their second floor, and then denying them a permit to connect to the walkway out back. Word around Wilmington Street is that the owners are ready to build, but are being stymied by the city at every turn. A gluten-free restaurant sounds like a great addition to the downtown area. Bill, I too have heard that they will be serving twelve different kinds of gluten-free beer. And, hopefully, PBR. There was a gluten free restaurant on Person Street down from the Kristy Cream but they went out of business. I too would love to see whats behind the steel. I think it would be cool to rebuild/restore that look on the building next door. Ive really been curious about that place too. Id love to see it restored as well but not into one of these new places that over does it, but does it right. just a true sandwich shop. In the 70″s,me and my grandmother used to eat hot dogs at TRSS. The lady that ran the restaurant was always pleasant. Its sad to see the building abandoned like that. Hi is this Building For lease if so can you please contact me back ASAP therealdj919@gmail.com . LJG: I saw that Robin Trower show also. Was 1984 or 1985. You Are Invited to Explore ‘Lost Raleigh’ This Sunday, April 23, at Mordecai Historic Park.